Crocodiles and Alligators are not picky eaters, but they do need a balanced diet if they are going to grow up to be healthy and reproductive. 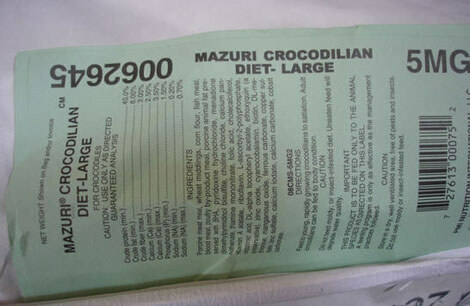 That is why we partnered with Purina to help create Mazuri Crocodilian Diet. That’s right, Purina even makes alligator chow! The St. Augustine Alligator Farm and Mazuri™(a brand of Land O’Lakes Purina Feed focused on exotic animal diets) worked together to make sure that the alligator chow would be a balanced diet and that it would be palatable to our animals. 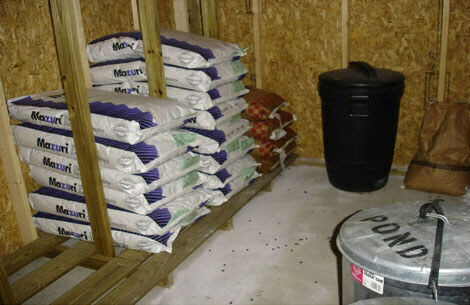 When we first met with the folks from Mazuri™ we were surprised at how accommodating they are. They said they could make us alligator biscuits in any size, with any color, that floated for as long or as little as we chose. Together we created a diet for our alligators and crocodiles that has everything they need to be healthy for their entire life. Of course we still offer other food items occasionally, especially when we are doing our feeding shows. They wouldn’t be near as exciting if all we did was dump in a bag of biscuits. It was also interesting to watch our animals learn to eat the biscuits. Alligators and Crocodiles typically grab a piece of food and hold on tight. But when they do that to the biscuits they crush them and they just turn to powder. But now that they are used to it, it is amazing how gentle they are. Purina has made large biscuits that we can use for training. This means that keepers can have a biscuit or two in their pockets to reward good behavior. In the old days, they would have had to carry a chicken, rat, or nutria with them to accomplish this type of training. Yes, they can be trained! Watch alligator training with the biscuits. 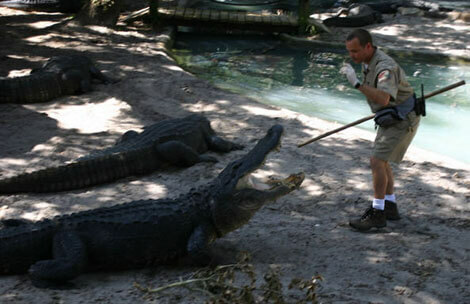 Another benefit of the biscuits is that YOU can feed our alligators without getting your hands covered in fish or worse. Just stick a quarter in the machine and you can start tossing out alligator biscuits. Some of our animals have even learned to sit with their mouth open when they hear a quarter go in the machine. Watch video. *We’d like to thank Dr. Kent Vliet, Dr. Darryl Heard, and the folks at Mazuri™ for helping us create this diet for our beloved animals.